Also ordered an EK FC block today, hopefully I'm in the first batch that ships from Europe this Friday. Coo- is Dazmode getting those in? or did you order from Aqua Computer in GDR? I need one too! Does anyone know where I can buy a XFX Double Dissapation from? Everywhere I look there is only the black edition and their standard core-edition. NCIX had a title error they put XFX DB Core Edition ...when it was just a Core Edition, I went to their store and it was just their OEM single fan design. ^ online shows them for preorder only, which would make me believe they havent been release, and will probably be release with the 7950. NCIX will be getting some DDs on around teh 17th so not too long a wait. I'm sure its a screw-up, but if you follow the link in their promotional link, the DD is cheaper than the single fan version. Last edited by Babrbarossa; January 12, 2012 at 12:10 PM. Awesome! Where did you get that info by the way? Last time I asked them, the sales guy seemed a bit iffy. This is what i was thinking, i really think the 7950 vs 7970 is going to be exactly the same as the 6xxx series was. 7950 will outsell the 7970 simply due to cheaper and overclock to the same. They pushed back the 7950 launch so all of us who want the "new" toy will buy at premium lol so they can recoup from bulldozer fiasco. That's a pretty large assumption based on absolutely NO facts. I dislike these sorts of posts. Sorry. The best part about these cards are the current positive reviews and beating out Nvidia. They finally rebuilt their architecture which many many people whined about them NOT doing and appeased the masses. From what I understand there is much headroom on these newer cards and that is always great news. As far as the 7950's go there is always gonna be a lower ended card to fill up the hole and make more money from people with a smaller budget. Whether they grant people access to overclocking them up to the 7970 speeds is irrelevent and frankly shouldn't be granted. If I'm paying top dollar for a faster card than it should stay that way... period. I think the price point for the 7970 is fantastic... this way when card makers do come out with better options like cooling and clocking the people who jumped on board from day one get what they paid for... frankly AMD has been taking the high road for some time now and is a very respectable company with a great product. I've never seen AMD release drivers that specifically KILL hardware like Nvidia did with the 285's and 275's. FACT: 3 of my friends had 285's that died within the same week of that particular driver. Ever wonder why XFX dumped Nvidia? I also feel bad for the last CPU they released... it's a real shame and I hope they continue to make CPU's for computers. Last edited by clshades; January 12, 2012 at 03:11 PM. Lol nope.. pure guess. If i am correct i will be happy i didn't buy 7970 at launch, if i am wrong i will buy it a month later. XFX is only offering 2 year warranties on some of it's cards now. 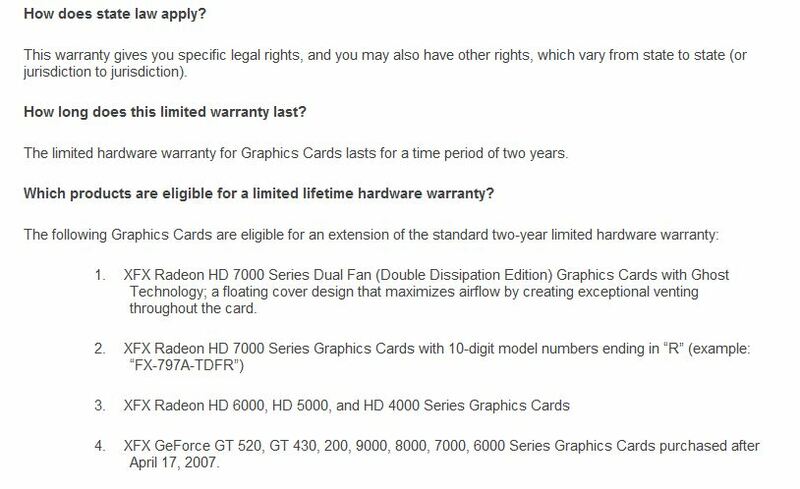 [PSA] The XFX HD 7970 has a two year warranty. That's why you buy their Double Dissapation models!! Or you buy Visiontek for their lifetime or Diamond for their 5 year warranty.